ASTERIA was the Titan goddess of falling stars and perhaps of nighttime divinations such as oneiromancy (by dreams) and astrology (by stars). Asteria is a small woman, one that is often seen as frail and delicate, though that is far from the truth. Her frame is tightly wrapped in well defined musculature. She is not designed for brute strength, no, but she is more designed for agility and speed. This is more than one mare though. Inside the body is a swirling mixture of two. A chimera of opposites and perhaps what drew the Coyote to bless her as it had. 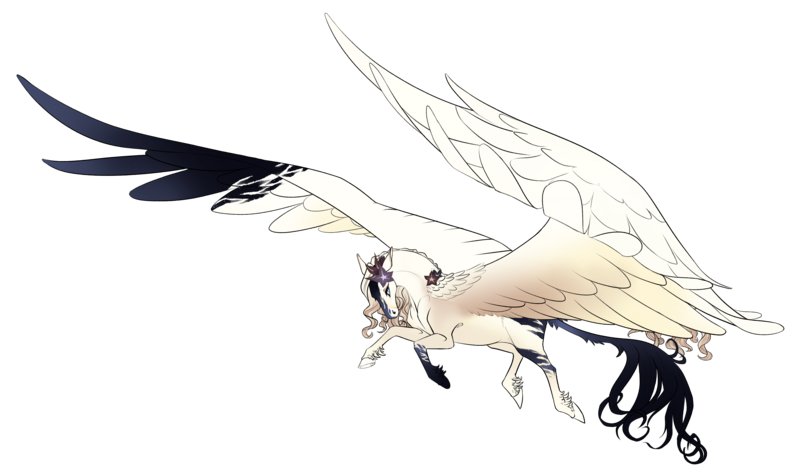 Most of her, the host, is of a delicate pale hue with a gentle gradient that spreads from beneath her feathered wings. Her nose darkens lightly like a marshmallow just beginning to toast. Cutting through it a white blaze. on her nose. Her hair bears a similar hue, curling not in a mass, but like sand when the tide rolls back and exposes it's careful handiwork. But it takes two to tango and in this case, she is both. Much like the sky, the day must yield to the night. It looks like a virus, strips of darkness cover her pristine coat. Her face is unevenly split in two, the end of her right rings appearing to be dunked in ink, and perhaps the most bizarre is her tail. Well. Tails. It was almost as if she started to split back apart before birth, she bears two tails. One in her ivory hue with the familiar curls bouncing at the end and the second, dark as night. Instead of curls, the hair at the end is long, sleek, whispy. The very opposite of her light, bouncy other half. Something she never takes off is a collection of flowers. They never seem to fade or wither, their blooms strange and enchanting. They spread out in 5 petals, dark in hue. From the center, it appears as if a small pale flower rests in the center. Across the petals, star like speckles to contrast her pelt the color of sunlight. Contrary to her elegant appearance, she also has a suit of armor. A thin, sharp horn on the helm, a skull like design a stark contrast against her. Metal like ribs and bones to protect her as she sticks her neck out into danger. There is no telling Asteria what she can't do. Stubborn and headstrong, she will do everything in her power to do just that. It is for this reason she's become the fighter she is today. From a young age she was told she was too small, too delicate. She'd never win in a fight, so of course that's exactly what she became. While she may not be able to throw her weight around like the big guys, they sure do fall quickly when their legs are damaged. This insistence to do things she's not supposed to however has gotten her into quite a bit of trouble. Going places forbidden, doing things against orders. It's easy to see why no one keeps her among their ranks for long. It's not as if she is trying to cause issues for others, but her rash decision making leaves much to be desired. Her ego only egging her onward into disaster. She surprisingly playful though. Be careful of Asteria's pranks, which, while harmless, are often poorly timed and causing a bit of an uproar especially when her superiors learned of the mare's shenanigans. Asteria was born in the far corner of Brekka, Tryggr. Her parents were of no significance other than they were just that, her parents. they held no land, no title, no say. They had love though and that was everything to them. They gave all they had to each other and when her mother fell pregnant with the one later named Asteria, they were ecstatic to expand their family. Time rolled on what was once thought to be one foal was then thought to be a rare pair. That was until the dream. One night, the mother woke with a fright, muttering something about a dream, a nightmare. She never did quite explain what she saw, but she would often mutter something about an eclipse and a laugh that made her stomach churn. She fell into despair, afraid that what ever she was carrying wasn't right. It wasn't the same as them and in a way, she was right. The foal they had given created was in fact two forced to exist in the same space, occupying the same body and she wasn't any normal equine either. No, no, she was a spiritborne evident by the use of her magic near as soon as she could walk. They weren't sure by who or why she was blessed of cursed with this gift, but her parents were afraid. Whether it was for her sake or their own was unclear, but they tried to distance her from the rest of Tryggr. It wasn't too difficult considering they lived near the outskirts, but they couldn't keep her separate forever." One morning, a troop of soldiers came passing through. It was an odd occurrence and never before had she others like that before. They're muscled frames and imposing aura did not frighten her. Instead it intrigued her. She tried to follow after, chirping all sorts of questions only to be shut in a harsh manner. A large man's stern voice spoke down to her. The guard was no place for a small girl like her. She was too weak. Too frail. Her own parents tried to convince her of the very same thing. Little did anyone know that it would only push her forward towards the very thing she was warned of. Hardly a year of age, Asteria left her parents in the cover of night and sought refuge in Berg-Risi. It was here that she was reluctantly allowed among the other youngsters training to bear arms in the name of Tryggr. It didn't take long for them to realize that she didn't quite fit into the mold. But rather than change herself, she fought to change the mold. Working hard and pushing boundaries, she improved herself. She was no foot soldier. She could not stand on the front lines with the others like she dreamed. But there she stayed and trained for two years. Her magic growing more powerful and her more creative with its uses. Unfortunately, that means she grew bored and thus the pranks ensued only placing her on thin ice which didn't take long to break. Other's of her age were starting to be enlisted as actual sodliers, gaurdsmen. While she had been fitted with armor that would actually fit her short frame, Asteria was deemed unsuited for battle and decommissioned. Distraught and unwilling to take it laying down, Asteria took the armor and fled Tryggr, the only place she's known. Feeling betrayed and abanonded by House Tryggr, she renounced them, but couldn't bare to betrayed the ones that were once her own people that she vowed to protect. Instead, she fled south, hiding herself in the mountains near the bifrost. It's been a year since then and it seems solitude is more a waste than being on the side lines in Tryggr. Who know where he troy will lead from here, but time will surely tell. Apprentice: The chimera is only just scratching the surface of her power. While it doesn't take much to conjure these images, they are brief and fleeting, having not yet learned how to keep them around. A shadow moving in a strange way, her appearance shifting, it's convincing, but only lasts for the blink of an eye before reality once again takes control. Adept:LOCKED Growing ever more comfortable with her power, she able to further bend the perception of reality and hold it for longer. Maybe a minute at most. It is rather easy to distract her and interrupt the visions at this point. That is, if one able to tell that it is in fact an illusion. Master:LOCKED The scale at which she create these images is astounding and they last much longer. The images are harder to disrupt and far harder to discern from the truth. From shadows to soldiers. She can ever change the look of the setting within a few feet of her. Making desert look like water, and plains sprout trees. Virtuoso: LOCKED There are no limits to the imagery she can conjure. If she can imagine it, she can make it appear real. Be wary of the Coyote's spiritborne for this trickster can now even change her own appearance and voice into that of anyone she's met. You never know just who she might be. As long as she is conscious, she can keep the illusion going, but it will melt away should she go to sleep or fall unconscious. Blessed by the spirit Coyote.